All About Screens mobile screen service carries a variety of pet friendly products to help keep your house cool with the windows or doors open, while still keeping the bugs and your pets out. We have a pet resistant screen material that is 7 times stronger than regular screen material. Pet screen resists damage by dogs and cats, and it has excellent outward visibility. The screen is made of strong vinyl-coated polyester to withstand pet abuse but is not harmful to them. The pet screen has more elasticity than our regular fiberglass screen mesh. Our pet screen is available in two colors, black and gray. Most of our customers are very happy with this product. We can also apply pet grilles to your screen door. 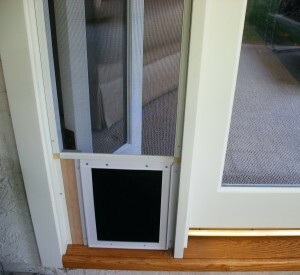 Pet grilles are placed on the outside of the door to prevent your pet from pushing through or damaging the screen. These are particularly helpful with dogs that like to jump up against the door. Pet grilles come in several sizes and and colors. The most common colors that we carry are in white, bronze, and aluminum but can be custom ordered in a different color. 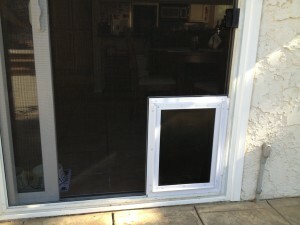 We also carry pet doors or doggy doors as most people call them. We carry the Pride brand pet doors. The doors themselves are made of a flexible, heavy duty rubber that will not crack in winter or warp in the summer. They also have magnets embedded into the bottom of the rubber door so they return to the closed position for closing efficiency. Our pet doors come in several sizes designed to accommodate the size of your pet. They can fit a pet as small as a cat to a large dog. An easy measuring rule of thumb to get a good idea of the size you might need is that the pet door should be roughly one half inch wider than the width of the pet’s shoulders.